Why Creating a Client Relationship Management Model Will Fuel Growth? The way a business or company relates to its clients is a huge part of how your company is perceived. Client relationship management is often paid homage to but the companies that stand out have taken real time to think through how to do this so that every point of contact with a client is consistent with the values of your organization. How much time do you spend with a client, how do you involve them in your business, how do you go out of your way to accomodate them. These are just some of the questions you need to think through. What exactly is “customer intimacy” in the context of client relationship management and why is it so critical in today’s business environment? How can you create this culture of service so your company thrives and separates you from your competition? Customer intimacy may have different definitions depending on whom you ask. Forbes magazine once explained this term as foreseeing what your customer prefers, and then implementing that information in your business plan and decision making. For others, the model focuses more on person-to-person relationships with long-term goals in place, which can result in customer loyalty, a great reputation, excellent recommendations, and approval. How can you instill a customer intimacy or client relationship management model within your business? Is customer loyalty critical in order to compete with the bigger fish in the sea? Independent businesses have the advantage of pursuing relationships with their customers by knowing exactly what they want and creating a lifetime value. Look closely at your branding. What does it communicate? Is it consistent with the delivery of your product or service? Is your brand positioned to your target client, or is your message challenging for your customers to understand? Review your communications. Are your external correspondence platforms (e.g., direct mail, website, social media, blogs, and emails) easy to understand with a clear message, or are your customers receiving mixed signals that can cause them to step away and seek out your competitors? This often happens when consumers receive contrasting information regarding product messages on warranties, discounts, or special offers. Understand your customers’ needs. Let’s take a look at Zappos, the phenomenally successful online retail company launched in 1999. Zappos’s founders used a customer intimacy model, which has been the primary source of their success. They knew that their busy customer wanted an easy online shopping experience, with quick, low-cost delivery and effortless returns. And that is exactly what they did. They eliminated trips to the post office and expensive return shipping costs, and provided a predictable relationship between their customer service employee and their consumer. Because of this, their substantial growth is based on repeat customers as well as excellent word-of-mouth referrals that spread like wildfire. Zappos understood their customer. Free shipping and returns, a call center that follows no script and allows a customer to envision a human face on the other end of the telephone line, and a core value of “building open and honest relationships” all contribute to Zappos’s current success. Surprise your customer. Let’s take another look at Zappos. While their website says that delivery may take up to three days, thousands of buyers are surprised with next-day delivery service at no extra charge. One of their customers reported that she ordered a pair of shoes on a Monday afternoon, and they were at her doorstep the next morning. Too many businesses today offer average service and products that fail to impress in any significant way. What ways can your company provide an exceptional experience to your target client, who will then pass along the word to others? I have often said that a solid word-of-mouth referral is equal to the effort in seeking 15 new customers. Companies that do not rank well in terms of customer service are those that have a difficult time focusing on their clients’ needs. For example, many of us dread calling our cable or insurance companies, simply because we may be on hold for long periods of time. It can also be difficult to locate the right department, and their representatives seem to follow a script that lacks any personal conversation or assistance. Quite frankly, many of these companies have little incentive to improve their customer relations because they face little competition, and they hire employees who simply don’t care if we cancel our service as it doesn’t directly affect them. In 2014, Comcast lost 305,000 video subscribers. The organization was “awarded” the Worst Company in America by Consumerist readers. Customers sited long lines at service centers, extended telephone waiting, a lack of significant weekend office hours, and differing information from employees. What’s the take-away from these frustrating experiences? It’s simple: Comcast has the wrong priorities. So it wasn’t surprising when, in September 2014, Comcast acknowledged their customer service blunders and undertook improvements. But is it too late? Ignore client relationship management and you can put your entire business at risk. With social media, consumers are not hesitating to let people know if a business has terrible service. In fact, many companies today hire employees to specifically manage their social media complaints. Some consumers found a faster response to their grievance through Twitter due to the attention focused on social media issues. Companies that are highly regarded by their customers (e.g., Nordstrom’s, Apple, Trader Joes, and Zappos) are committed to engraining quality throughout their businesses. From the top to the bottom, employees are trained to create a pleasing customer experience—and have fun doing it! 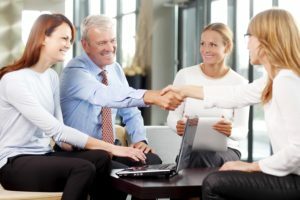 Again, the most successful and profitable companies have figured out an effective client relationship management system that keeps their clients coming back for more. The overall key is to focus on your target clientele and understand them better than anyone else. Design your product and service to help you get noticed and be remembered. It’s not only about being nice. It’s about being available, helpful, and constructive.